Matt Lipka does not have any MLB stats for the season. Draft: 2010, Atlanta Braves, CAth rd. April 9, 2019 Scranton/Wilkes-Barre RailRiders placed OF Matt Lipka on the 7-day injured list. 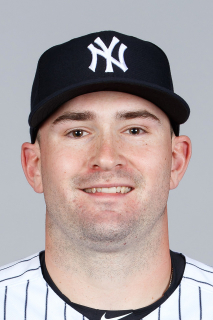 January 11, 2019 New York Yankees signed free agent OF Matt Lipka to a minor league contract and invited him to spring training. January 11, 2019 OF Matt Lipka assigned to Scranton/Wilkes-Barre RailRiders. November 2, 2018 CF Matt Lipka elected free agency. April 1, 2018 CF Matt Lipka assigned to Richmond Flying Squirrels from Sacramento River Cats. March 23, 2018 OF Matt Lipka assigned to Sacramento River Cats. January 29, 2018 San Francisco Giants signed free agent OF Matt Lipka to a minor league contract. November 6, 2017 CF Matt Lipka elected free agency. May 31, 2017 CF Matt Lipka assigned to Down East Wood Ducks from Frisco RoughRiders. May 16, 2017 CF Matt Lipka assigned to Frisco RoughRiders from Round Rock Express. May 15, 2017 CF Matt Lipka assigned to Round Rock Express from Frisco RoughRiders. March 28, 2017 CF Matt Lipka assigned to Frisco RoughRiders from Round Rock Express. February 26, 2017 OF Matt Lipka assigned to Texas Rangers. December 16, 2016 Texas Rangers signed free agent CF Matt Lipka to a minor league contract. December 16, 2016 CF Matt Lipka assigned to Round Rock Express. November 7, 2016 CF Matt Lipka elected free agency. August 29, 2016 Gwinnett Braves activated CF Matt Lipka from the 7-day disabled list. August 23, 2016 Gwinnett Braves placed CF Matt Lipka on the 7-day disabled list. June 15, 2016 CF Matt Lipka assigned to Gwinnett Braves from Mississippi Braves. March 17, 2016 CF Matt Lipka assigned to Atlanta Braves. September 22, 2014 Mississippi Braves activated CF Matt Lipka from the 7-day disabled list. July 11, 2014 Mississippi Braves sent CF Matt Lipka on a rehab assignment to GCL Braves. May 5, 2014 Mississippi Braves placed CF Matt Lipka on the 7-day disabled list. Left hand contusion. March 31, 2014 CF Matt Lipka assigned to Mississippi Braves from Lynchburg Hillcats. January 13, 2014 Atlanta Braves invited non-roster CF Matt Lipka to spring training. March 29, 2013 Matt Lipka assigned to Mississippi Braves from Lynchburg Hillcats. March 8, 2013 OF Matt Lipka assigned to Atlanta Braves. September 24, 2012 Lynchburg Hillcats activated CF Matt Lipka from the 7-day disabled list. June 26, 2012 Lynchburg Hillcats placed OF Matt Lipka on the 7-day disabled list. June 11, 2012 Lynchburg Hillcats activated OF Matt Lipka from the 7-day disabled list. March 29, 2012 OF Matt Lipka assigned to Lynchburg Hillcats from Rome Braves. March 9, 2012 Atlanta Braves signed SS Matt Lipka. April 3, 2011 Matt Lipka assigned to Rome Braves from Danville Braves. March 19, 2011 SS Matt Lipka assigned to Atlanta Braves. August 28, 2010 Matt Lipka assigned to Danville Braves from GCL Braves. June 21, 2010 Matt Lipka assigned to GCL Braves from Atlanta Braves. June 20, 2010 Atlanta Braves signed OF Matt Lipka.